Styl:us Show 2016 - a celebration of the art of vinyl | What Hi-Fi? 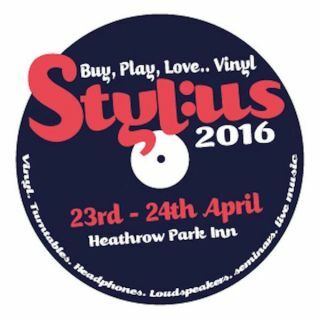 The Park Inn, Heathrow was turned into a mecca for vinyl lovers over the weekend of April 23rd-24th as Styl:us 2016 brought together turntable, amplifier and speaker manufacturers, hi-fi retailers and vinyl sellers. Supported by industry trade body The Clarity Alliance and organised by The Chester Group, Styl:us 2016 was aimed at those who "buy, play and love vinyl". Around 25 exhibitors took part. On display were any number of exotic, high-end turntables and hi-fi systems, all manner of accessories to go with them and in the central foyer Diverse Vinyl and Theme One Records had a broad selection of new and secondhand vinyl for sale. Visitors were treated to a series of special events including a seminar on 'How to set up your turntable' by Hi-Fi+ Editor Alan Sircom, and 'The Rise and Fall of Ziggy Stardust and the Spiders from Mars' presented by Jeff Lloyd from Vinyl Frontier. Jeff played the entire album with accompanying slides, photos and video footage on a £105,000 hi-fi system supplied by Sound Fowndations. Want to know what that £105,000 system consisted of? Of course you do, so here goes: a Clearaudio Master Innovation turntable, Clearaudio Universal 12in tonearm, Clearaudio Da Vinci V2 MC cartridge, Clearaudio Absolute Phono Inside phono stage, Gamut D3i preamp, Gamut D2000i power amp and Gamut RS7i speakers. Oh, and a Blue Horizon rack. Elsewhere there were products on show from - among others - Pro-Ject, Lehmann Audio, Opera Loudspeakers, Audio-Technica, Entotem, Roksan, Unison Research, Ming Da Valve Audio, Sony, Quad, Townshend Audio and Technics. New products at the show included the Ming Da Piccolo valve amp with MM phono stage, the latest models from Vincent Audio including its Class A 100W monobloc amplifiers with matching SA94 preamp, plus three new turntable supports from Protec Audio (above). To give you a taste of the rest of the show, here's a picture gallery of some of the other highlights.